Relax, unwind and let all the worries of the day slip away while enjoying the natural beauty of the outdoors with a backyard pond from Nature’s Re-Creations. Ponds can transform any backyard into an oasis retreat for any homeowner. At Nature’s Re-Creations in St. Louis, when it comes to creativity, our specialty is unique design. We will work with you to create your dream pond, but first we need discover your dreams. So tell us… What do you envision your backyard paradise to look like? How you would like to use your pond? Would you like fish in your pond? Would you like to swim in your pond? Do you imagine a lake-like pond? Tell us some of the places you have been. The great outdoors is best place to start for ideas and inspiration and the team at Nature’s Re-Creations will design your pond with these aspects in mind to make your visions come true. 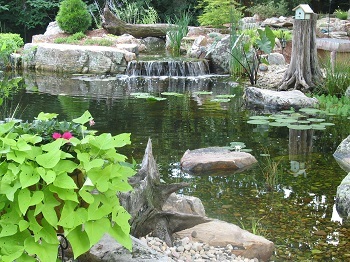 Nature’s Re-Creations designs and builds backyard ponds and water gardens in a variety of shapes, sizes and styles. We work your existing landscape into your pond design. Decks, driveways and patios are all strategically considered in the design process and can be intertwined into your water feature. The most common size for a starting pond is 10’x12’ to 11’x16’ – 2’ deep. But Nature's Re-Creations can create any custom-sized pond for your landscape. Whether you choose a small pond tucked in the corner of your garden or a large backyard pond, you won't regret adding a beautiful water feature to your outdoor space. We perform the entire installation of your water garden from small, medium to large ponds. As a Master Certified Aquascape Contractor, Nature’s Re-Creations creates features of high quality and design. Installation includes outlining the pond location, digging the hole, leveling the excavation, installing the pond liner, adding gravel, filling the pond and completing with foliage. Micro pond systems range from $8,500 to $12,000, while average range from $12,000 to $25,000. Although each is unique in design and creation, all backyard ponds require the same key components. We work with Mother Nature to ensure a low-maintenance water feature by taking a naturally-balanced ecosystem approach. With a mix of aquatic plants and terrestrial plants, fish, gravel, decorative rocks and boulders, and proper filtration, you can enjoy a healthy, beautiful work of art in your landscape. In addition to the scenic views and wonderful sounds backyard ponds provide, they also form a natural habitat for wildlife. Watch as your pond attracts butterflies, dragonflies, hummingbirds, frogs and more. 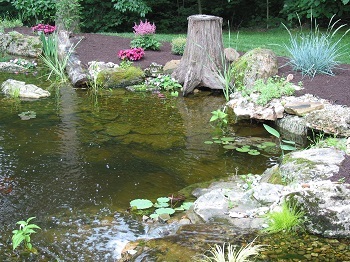 Check out our Ponds Gallery to see inspiration for your own landscape or Contact Nature’s Re-Creations in St. Louis today for more information at (636) 223-2330.